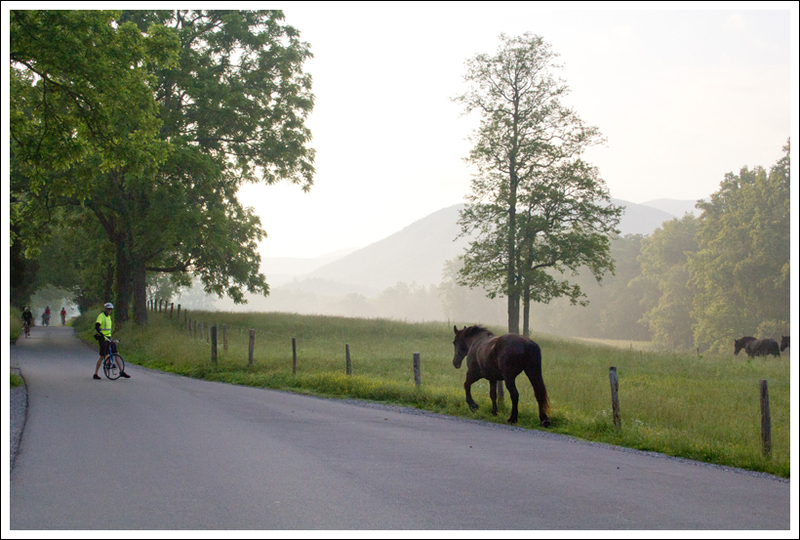 On Wednesday and Saturday mornings from May through late September, the eleven-mile Cades Cove Loop Road is closed to vehicles until 10:00 a.m. Don’t miss the opportunity to rent a bike and tour this scenic area without the nuisance of heavy car traffic! 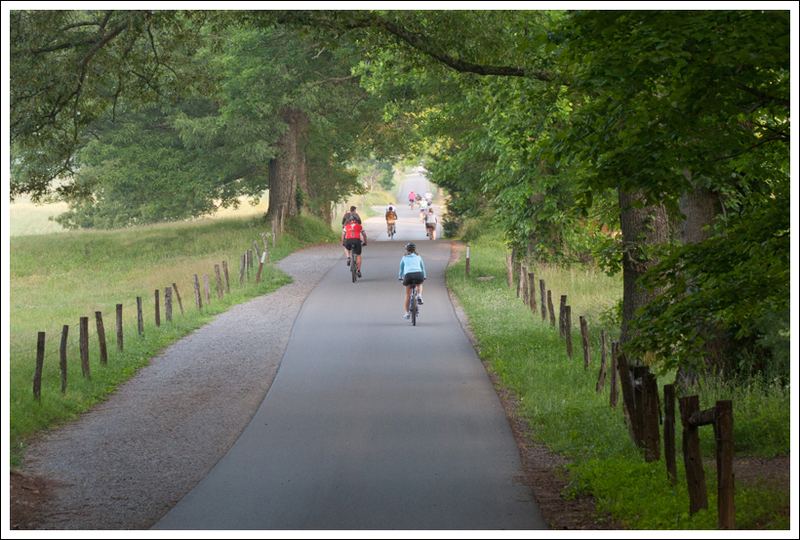 Biking the Cades Cove Loop is a popular activity on Wednesday and Saturday morning when the road is closed to vehicle traffic. 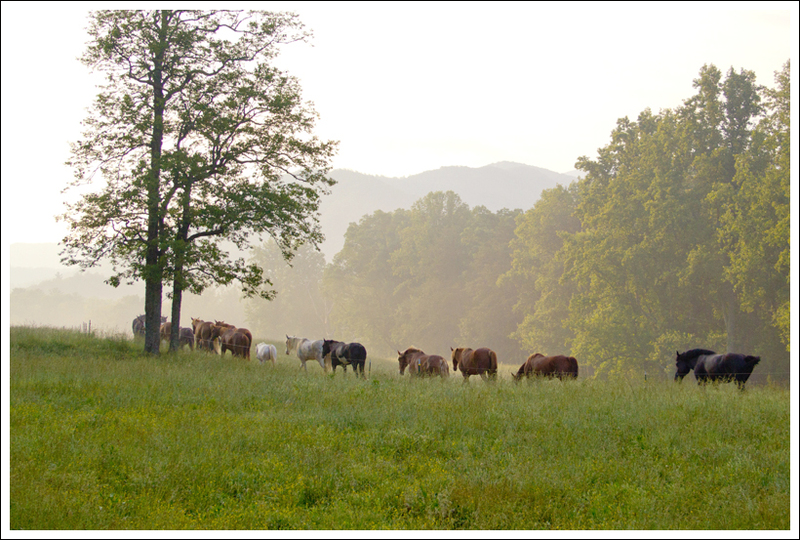 Below: The Cades Cove visitor center; Horses heading from the paddocks back to the barn; A distant view of a homestead. With that discussion done, we got up, packed the rest of the stuff in our room, checked out and headed toward Cades Cove. As I mentioned before, Gatlinburg starts breakfast late – even our hotel didn’t put the complimentary breakfast out until 7:00 a.m. The only choice we found for breakfast (other than gas station food) was ‘The Donut Friar.’ That turned out to be quite fortuitous! I’ve never eaten such delicious donuts. Even now… the thought of those donuts makes me feel a wistful sense of longing. I could write an entire post about those donuts, but I’ll move on to the biking. 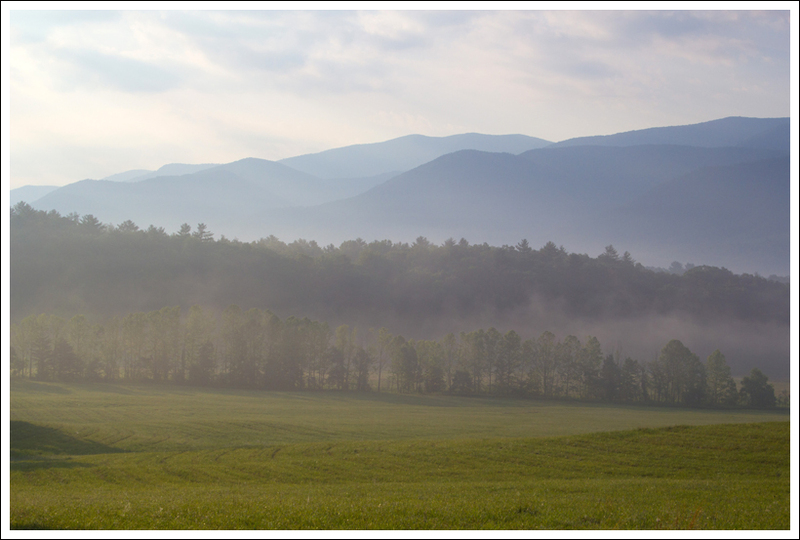 Cades Cove offers beautiful mountain and meadow views. Below: One horse (Ted) got loose and walked outside the fenceline; Christine coasting along; Three does make a run for it! When we had initially inquired about bike rentals, the attendant told us that the rental shop opened at 7:00, but that we should plan on getting there about 15 minutes early. Since it was Memorial Day weekend and the campground was full, they expected rentals to sell out quickly. For almost three quarters of the drive into Cades Cove, we didn’t see a single car. But at the junction with incoming cars from Townsend, we started seeing many. It was a line of moderate traffic rolling toward the cove. We were anxious enough that we didn’t even stop when we spotted a bear climbing a tree alongside the road. No way was I going to miss the chance to rent a bike after giving up my leisurely morning! Ironically, we ended up first in line at the bike rental shop. They opened promptly at 7:00 and we were on our way with bikes and helmets by 7:15. The one-way road through Cades Cove is normally a real log jam of cars. It can be maddening to go so slowly. So, breezing along on a bike was a true treat. 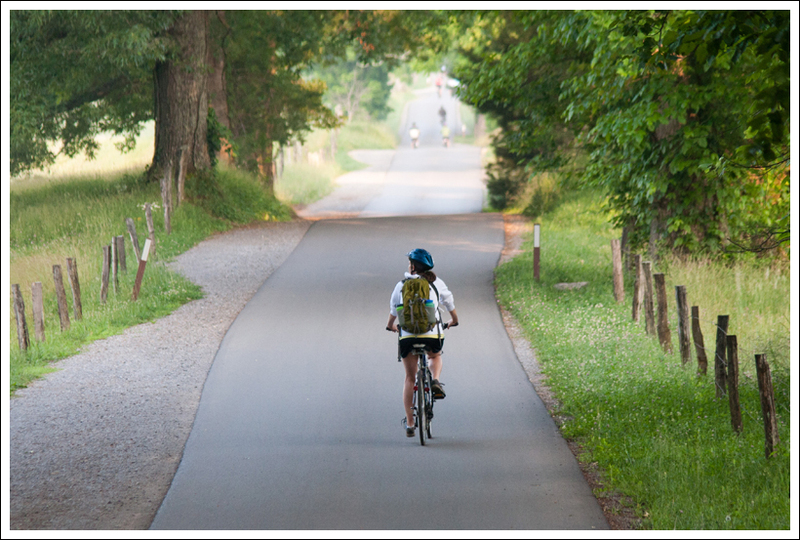 While there aren’t bike jams, do be prepared to share the road with lots of other bikes. Biking the loop is very popular! When we first entered the Cove, it was a beautiful misty morning. A thin veil of low fog was floating across the open meadow. The rising sun made everything look golden and shimmery. One of the first stops we made was to watch all the horses being herded from the field up to the barn for the day. One horse, a big draft-cross named Ted, decided to take an alternate route. 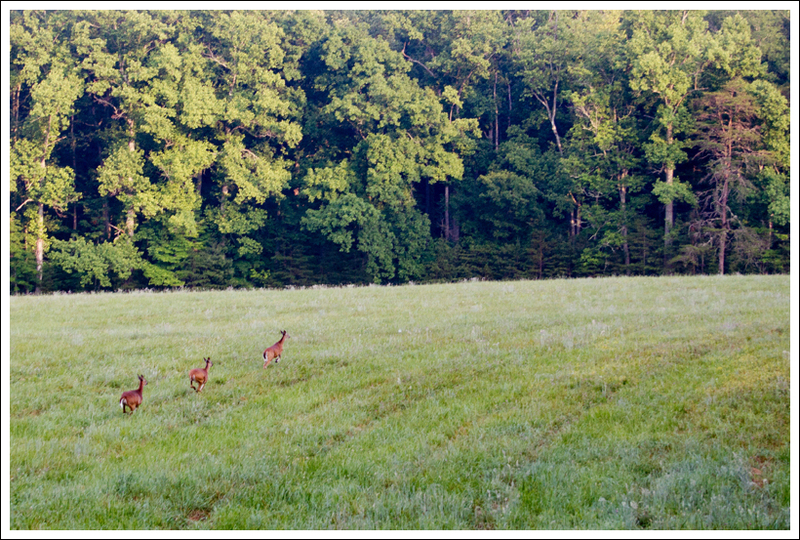 Instead of following his buddies through the field, he walked right out the gate and headed up the road. One of the volunteers who help keep the road safe radioed back to let others know a horse was on the loose. Ted didn’t look like much trouble though. I’m sure someone caught him and ushered him back to where he belonged. I sort of gathered from the conversation that this was not Ted’s first foray out onto the road. Along the way, we passed old churches, old homesteads, and old barns. Normally, I’m pretty interested in history and park-lore, but on this particular morning I was in the mood to keep biking. I was having fun coasting down the steeper hills. It felt great to pick up some speed and feel the wind against my face. There are lots of old homesteads in the Cove. Below: There are also lots of churches; And evidently, lots of invasive wild hogs! We had hoped to see more bears on this ride around Cades Cove, but we struck out. Thankfully, we had already seen seven bears during our week, so we didn’t feel too disappointed. 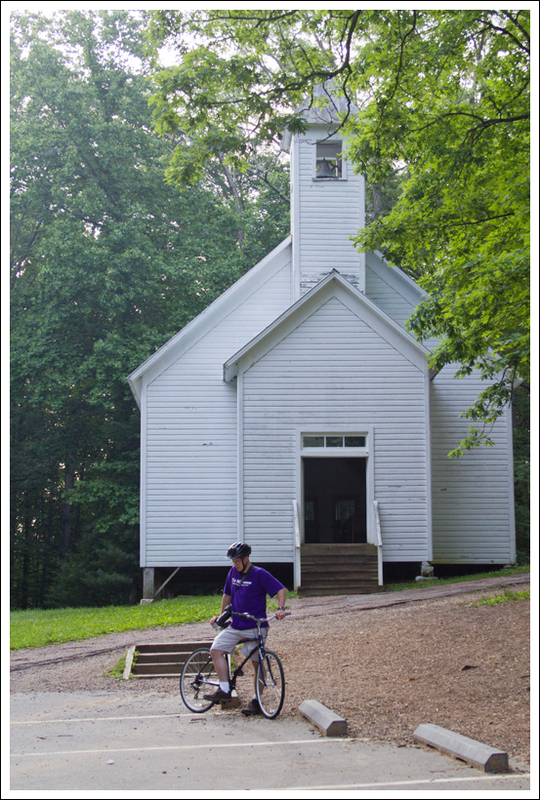 The one thing that surprised me about biking through Cades Cove was that some of the hills were actually pretty challenging. When you drive around the cove, it seems mostly flat or perhaps ‘rolling’. While none of the hills are long, there are a number that are quite steep and require some power-pedaling. The rental bike I used didn’t have quite as many gears as my normal bike, so that made things a bit tougher. We biked most of the hills without stopping or getting off, but there were two hills near the end where it just seemed more efficient to dismount and walk our bikes up the hill. When you can’t shift your gears anymore, and people are walking by while you valiantly pedal, it’s time to revisit your pride! 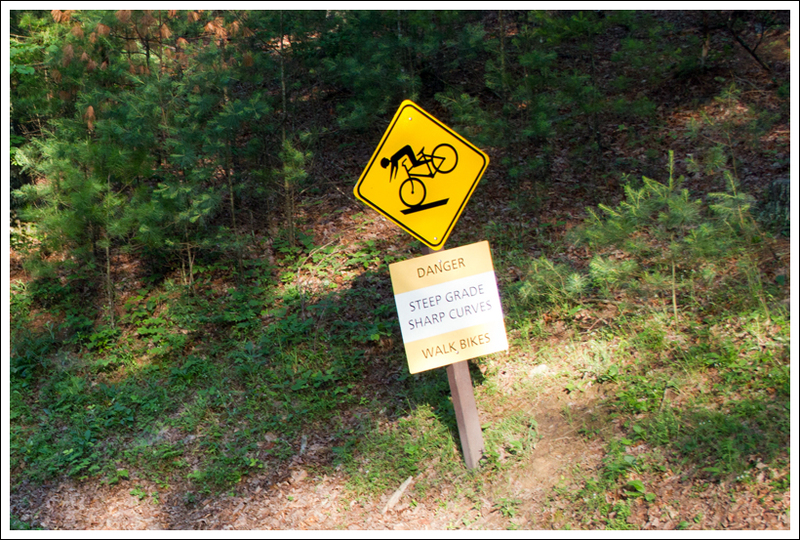 Besides, it seems that the majority of people walk their bikes a little bit in Cades Cove, so I didn’t feel too bad. 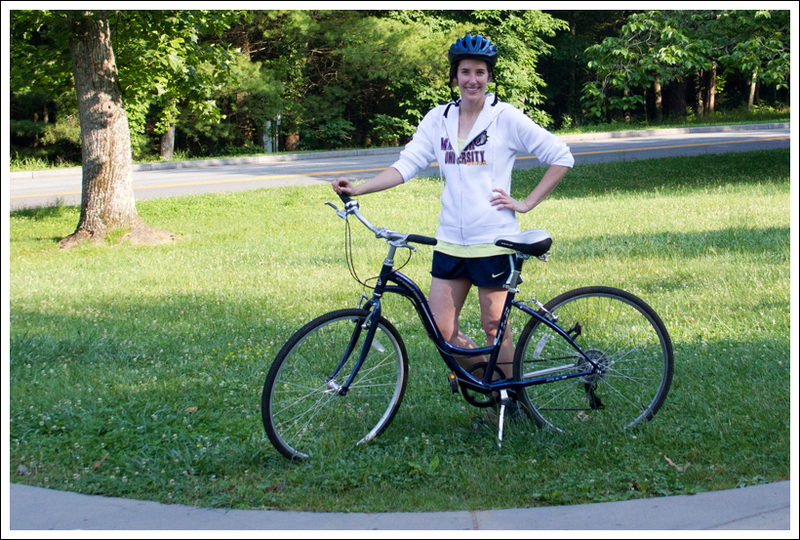 The whole loop took us less than two hours to bike – even with plentiful stops for scenery and wildlife. It was really a nice way to spend our final morning in the park, and I’m glad we made time to do it! Although, I was too exhausted to help with the drive home. I ended up sleeping in the car about half the way home – which is very unusual for me! Some of you may have thought we were done with our Smokies Edition posts and based on Christine’s inner-dialogue you can see that was almost true. But, we thought this opportunity was too good to pass up. We have always treated our vacations as days that we should run ourselves ragged. You can always be exhausted when you’re sitting behind your desk at work. At 7:15 when we started off, there were already plenty of bikes on the road. Since we didn’t have the foresight to bring our own bikes along, we had to rent them. The bike shop opened promptly and was very well-organized. The shop requires you to either put down a $50 cash deposit or leave your car keys. You pay for the first hour in advance and then pay the rest when you check back in. We ended up paying less than $30 for less than two hours, so it is quite affordable. We left the campstore and biked up to the Orientation shelter to start our loop ride. The road starts off fairly flat with large views of open farms. At 1.1 miles shortly after passing the intersection with Sparks Lane , you come across the John Oliver cabin on the right. Built in the early 1820s, this is the oldest building along the loop. The road becomes more like rolling hills at this point and some of the hills can be steep going up or down. Around the 2 mile marker, you come to the Primitive Baptist Church on your left, shortly followed by the Methodist Church on your right. 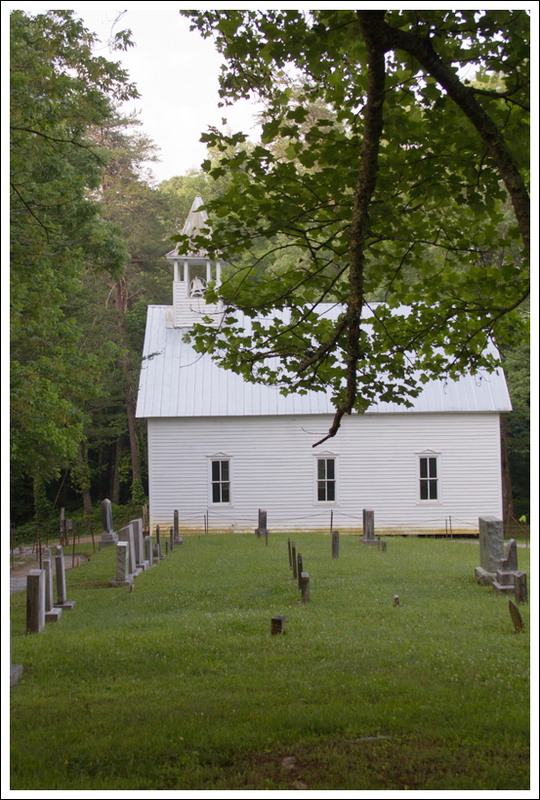 The Primitive Baptist Church was first established in 1827 as a log building, but the building that is there now replaced it in 1887. During the Civil War, this church closed since the church officials were Union supporters amidst a land filled with Confederate supporters. The Methodist Church was established in the 1820s as log building but was replaced by this building in 1902. Baptists outnumbered the Methodists in this area, but the populations were enough to keep many churches around. At 2.75 miles, you reach an intersection with Hyatt Lane, which does allow you to shorten the loop. A short distance later, you come to the Missionary Baptist Church on the left. Continuing on, the road begins to lead out of the woods again into more open areas. At 4.25 miles, you do reach a trailhead on the right of the road that leads to the Elijah Oliver Place. Elijah Oliver was the son of John Oliver, whose cabin you saw first. At 5.0 miles, you reach a junction with a road that leads down to the parking lot for the Abrams Falls trail. 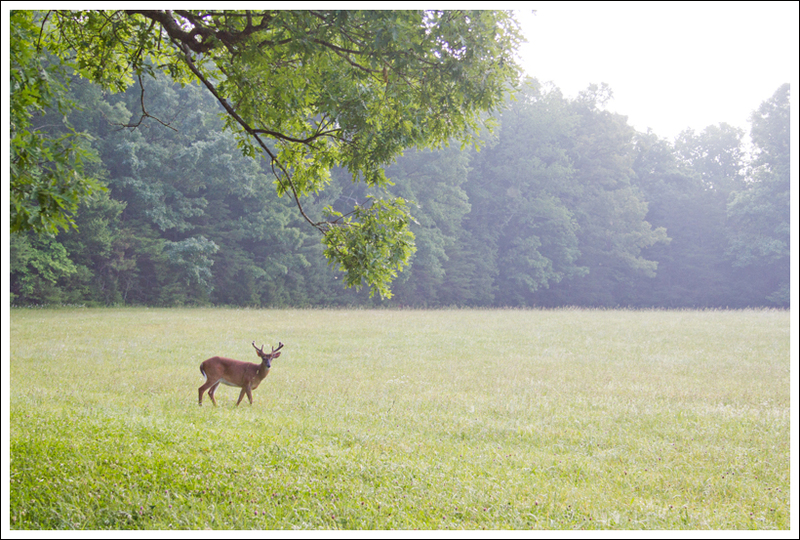 This solo buck enjoyed grazing in a misty meadow. Below: Some of the downhills are steep and curvy, so warnings are posted; Old cabins are abundant in the cove. 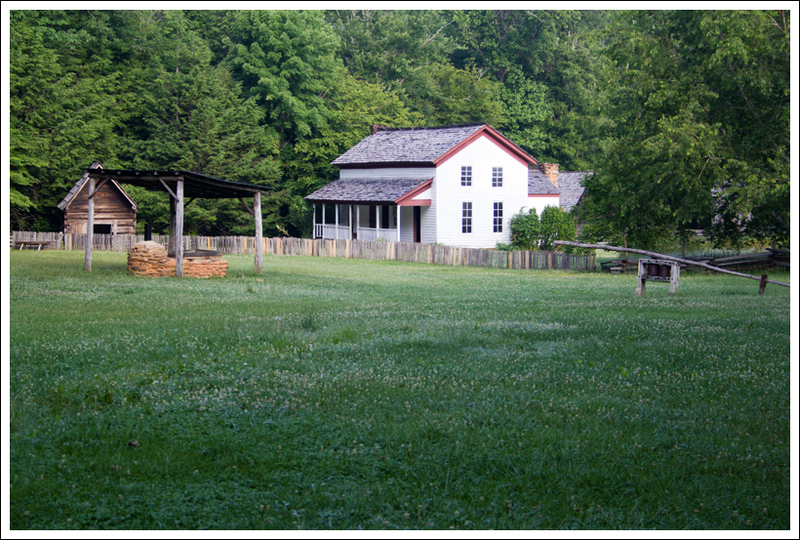 Within another half mile, you reach the large Cable Mill Historic Area and Visitor Center. 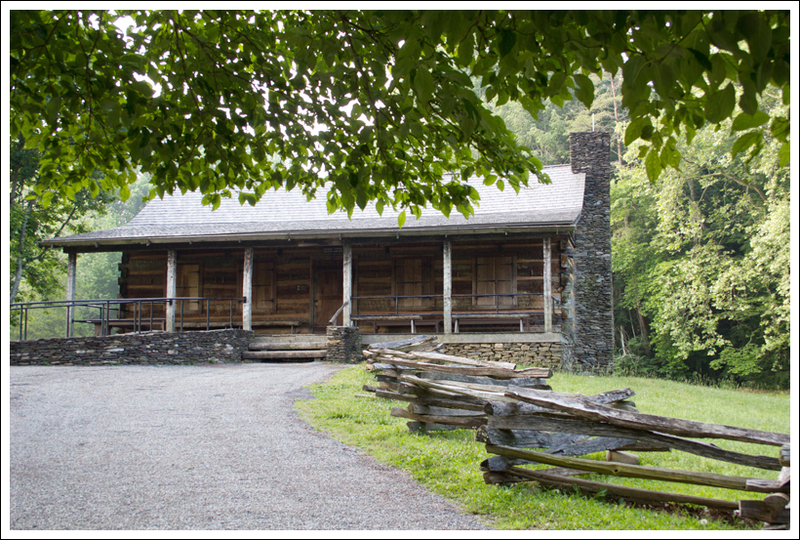 You can take a while to walk around the many buildings that are here including the Visitor Center, Gregg Cable House, grist mill, and LeQuire Cantilever Barn. Leaving the Visitor Center and rejoining the road, the trail becomes much steeper for a good portion of the remaining ride. At 7.0 miles, you will pass the Dan Lawson Place. At 7.5 miles, you reach the Tipton Place, a home built by a colonel in the Mexican War that housed his two daughters and was later rented out to others. At 8.25 miles, you will see the Carter Shield cabin on your right, one of my favorite buildings to see on the ride. 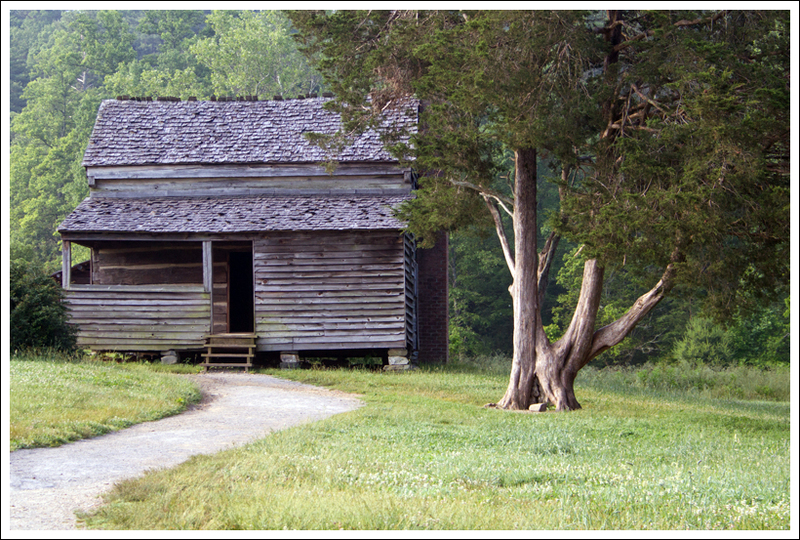 This cabin was built by George Washington Shields, who was wounded at the Battle of Shiloh. Continue your ride which re-enters the forest for the remaining trip until you reach the junction that leads back to the campstore at 11.0 miles. 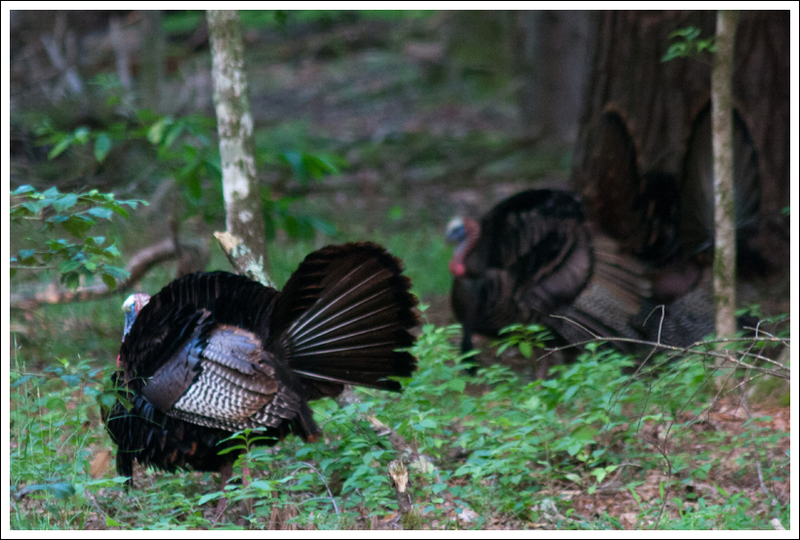 The male turkeys were putting on quite a show! Below: Bikers are treated to many open views – perfect for wildlife watching; Christine and her rented bike after the ride. One thing that makes this part of Great Smoky Mountain National Park so popular is the ability to see wildlife. Due to the large open areas here, wildlife viewing is prime. We had driven through the area an earlier day and we did see lots of deer, a few bears, and wild turkeys. When the road is open to cars, you should expect a slow drive around the loop. We even had people in a truck in front of us sitting in lawn chairs in the back creeping along to try and spot wildlife. I would strongly recommend if you want to avoid some crowds on the road normally, get up early and get here to bike the loop. You’ll be able to take in all the beauty and hopefully see some wildlife along the way before the crowds descend. When we were leaving, we were already seeing cars lining up to get ready to drive the loop. After we left the loop, we headed back to Virginia passing through Townsend and Pigeon Forge, TN. It is amazing that such a commercialized area is so close to such a gorgeous national park. I’m just glad that the National Park Service protected this land before it became overrun with visitors. 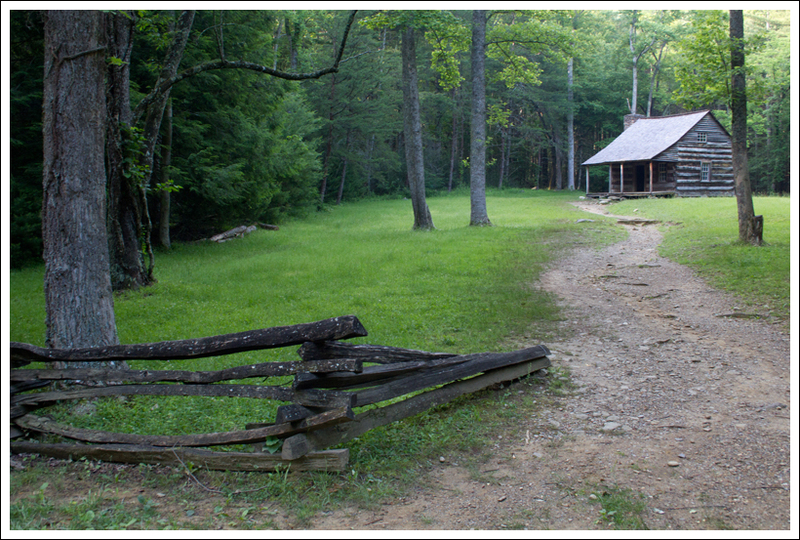 Like Shenandoah National Park, some of the people in Cades Cove were displaced by the national park service as they bought their land. Some were given the option to stay in their houses until they died, but their offspring were not allowed to live there. Difficulty – 3.5. There are many flat sections and downhills. The uphill sections are short, but quite steep. Trail Conditions – 5. The road is paved and in great condition. Views– 4. Lot of open meadows and views looking up to the mountains. Streams/Waterfalls – 1. There are a few small streams along the route. Nothing amazing or photo-worthy, though. Wildlife – 5. 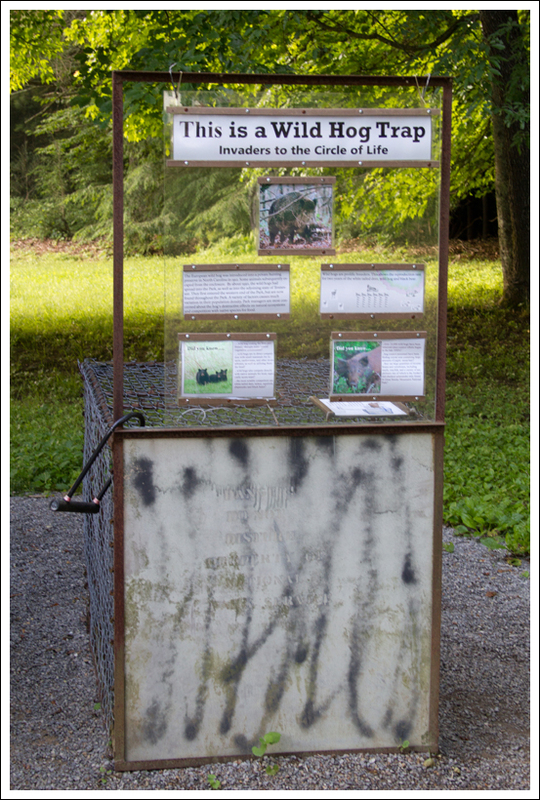 This is a great place to see all kinds of Smokies wildlife. Ease to Navigate – 5. Very simple – just follow the road and all the other bikers! Solitude – 0. Expect to see lots of other folks. Directions to trailhead: The Cades Cove loop is located on Laurel Creek road, 7.5 miles west of the junction of Little River Road and Tennessee Route 73 (leading to Townsend). Once you approach the main entrance, you will see a road leading to the campstore if you are renting bikes. Start the loop at the main entrance, near the Orientation shelter. Great info.Just to add to your info though the loop is not closed Wed. and Sat. ALL year round but from early May to late Sept. As a local who rides it almost every week during those months, I can tell you I never get tired of the views. The crowds can turn me off sometimes, but never the views! Thanks for the addition of information! I’ll update it in the post. Great information, getting up early tomorrow morning and biking the loop. Can’t wait! Have fun! It’s a beautiful ride! It must feel great that you can wear your collectible patches with integrity and honor, hahaha! 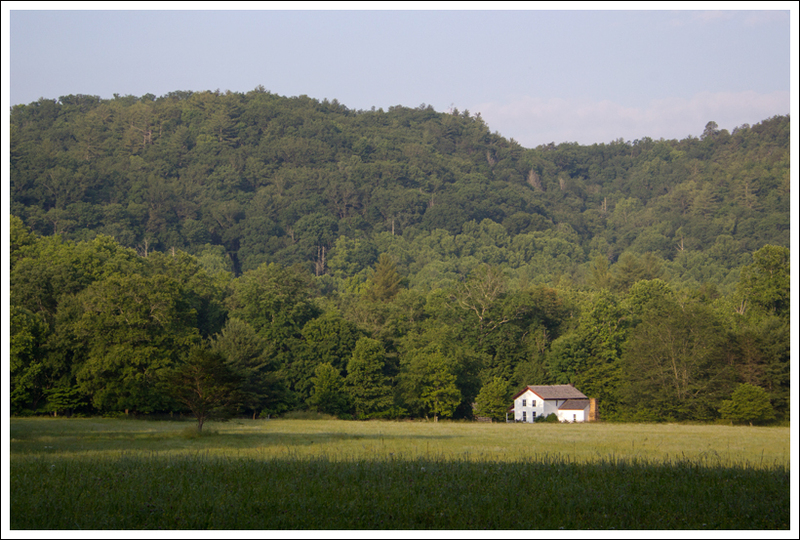 It has been a very enjoyable last few string of posts on (the) Virginia Trail Guide. By the way, I referred a friend to your site, recently. She was pretty happy to find it. I hope you can squeeze a few more hikes in before the really intense summer heat and humidity come…. This is a great information! I’m excited to explore. Have you been to the Smokies? I expected to enjoy our trip there, but I didn’t think I would LOVE it as much as I did. I can’t wait to go back.